Since 1351 the fortified city of Naarden has been situated in the heart of the Netherlands. In the late Middle Ages Naarden became the capital of the so-called region Het Gooi. It also used to be a very important eastern defence site for the rich city of Amsterdam that is situated approximately 20 kilometers to the west. In the course of history of the Netherlands, Naarden has played an important role in national wars and during attacks of the French and Spanish. Naarden was also a very important trade city. In 1675 the fortifications around the city were renewed and enlarged. 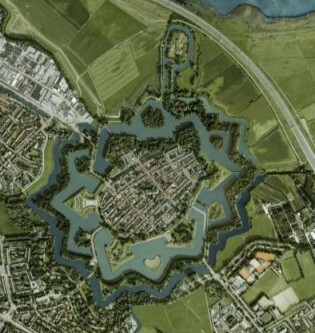 At that moment the typical star-shaped form came into being, with 6 bastions and 2 moats. At the beginning of the 20th century Naarden lost it’s active military function, but the fortifications have been kept until today. The walls, moats and constructions now look better than ever before in history. The Fortress of Naarden is the only fortified city in western Europa that has been completely restored and that is in perfect condition. Vestingvaart Naarden offers you the possibility to see the fortress, the defence system and admire the beautiful nature around the fortress from the waterside. From April to October we sail our historical open boat the Opwaarts every afternoon. On board an experienced skipper/guide explains all the places of interest. The tour lasts about one hour and the boat seats up to 20 people. The boat tour takes you through the northern moats and along the fortress Ronduit. Reservations are possible, but most of the times not necessary. You can just get on board and pay the skipper. The prices for the daily one-hour tours of can be found in the facing column at the right. Information about the tour season and the sailing schedule can be found at the page Seizoen en Vaartijden. 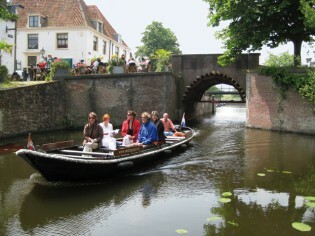 Vestingvaart Naarden also offers special tours e.g. for groups, weddings or family trips. We organize special tours as well, like evening tours or tours for nature lovers. 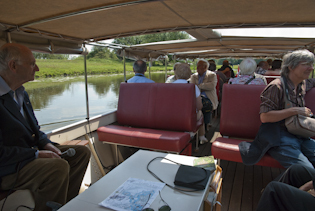 We also have a second ship, the Rondwaarts, which is equipped to accommodate up to 30 people. It has got comfortable benches, small tables and a linen roof. This makes sailing comfortable even when the weather is not that nice. There are lots of possibilities. For our special tours, we kindly ask you to make a reservation beforehand. Special rates apply. At the page Locatie en Route you will find information about the mooring sites of the boats and a route description. For further information or reservations you can contact the telephone number + 31 6 18271436 or you can send an email to: info@vestingvaart.nl.